There may be certain situations when you will want to remove the title of the page that appears just above the actual content on WordPress pages. 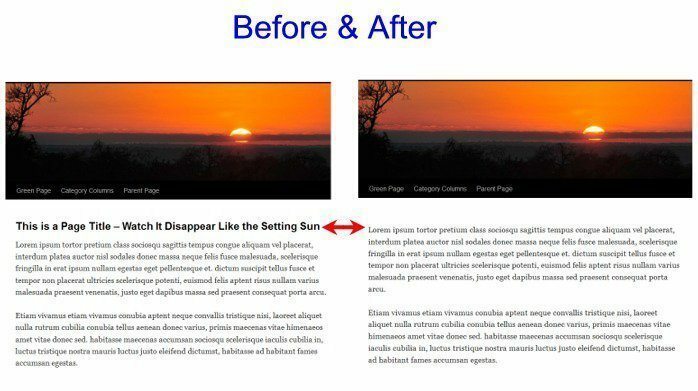 The placement and look of the page title is theme specific and you might want to remove it if you are using static front page option or just want a page on your blog that looks a little different than the rest of your WordPress pages. Since I am running out of ideas to post about here is a recycled post from a few years ago. To remove the title of your page that appears on the page above the content you will need to edit the page template file that is usually called page.php. To edit the page template within the WordPress dashboard go to Appearance, Editor and look for the page.php file on the right. Click the page template to load it in the editor. Now I strongly suggest that you copy all the code in the editor and paste it into Notepad or Wordpad and save it on your computer as a text file for backup. If you screw up just replace the file with the backup and then start over again. The ‘H’ tags may be different or not used on your particular theme so don’t worry if it’s not exactly the same, what you want to remove is the permalink and title code. After you remove the string of code scroll down and click Update File to save the changes. Now open and check a page to see if the changes are correct.